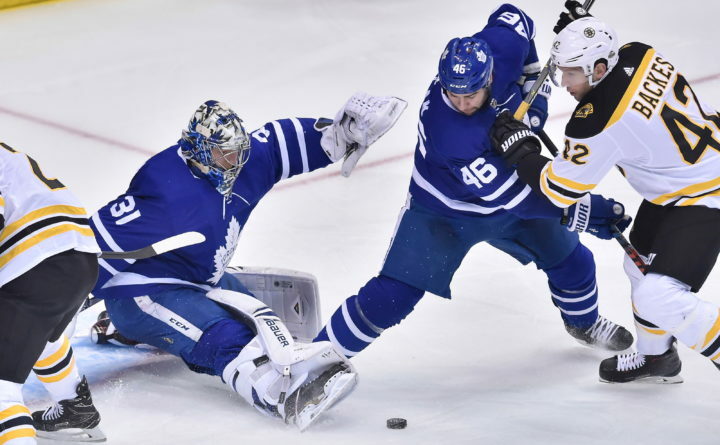 TORONTO — Auston Matthews scored the go-ahead goal in the second period, Patrick Marleau had two goals, and the Toronto Maple Leafs beat the Boston Bruins 4-2 on Monday night in Game 3 of their Eastern Conference first-round series. James van Riemsdyk also scored and Mitch Marner and Morgan Rielly added two assists each ti help Toronto pull to 2-1 in the best-of-seven set. Frederik Andersen stopped 40 shots. Adam McQuaid and Zdeno Chara had the goals for Boston, Sean Kuraly had two assists, and Tuukka Rask finished with 26 saves. The Maple Leafs will look to even the series at home in Game 4 on Thursday night. Matthews was held without a point through 120 minutes where Toronto was outscored, outmuscled and outplayed in losing by a combined 12-4 margin at Boston. However he came through to snap a 2-2 tie with 5:13 left in the second when he rifled a shot short-side highs on Rask from a sharp angle after a great feed down low by William Nylander. Boston’s top line of David Pastrnak (four goals, five assists), Brad Marchand (one goal, five assists) and Patrice Bergeron (five assists) totaled 20 points through the first six periods of the series while also holding Matthews and Toronto’s top unit off the scoresheet. But the Maple Leafs finally had an answer on this night as the Bruins’ trio failed to find the range. The Boston power play — which went 5 for 10 in the first two games — got its first opportunity early in the third, but Pastrnak hit the post off a feed from Rick Nash. The Maple Leafs finally sealed it with 3:35 left when Marleau scored his second of night on a 2-on-1 rush, firing a shot past Rask for the 70th career playoff goal. Pulled after allowing three goals on five shots in the first period of Game 2, Andersen robbed Pastrnak on a jaw-dropping diving stick save with Rask on the bench for an extra skater with just over two minutes to go to help preserve Toronto’s win. Toronto led 1-0 after the first, but Boston tied it at 3:06 of the second when McQuaid’s shot from the point squeezed under Andersen’s pad and dribbled in. The goal came moments after Andersen made a stellar glove save from his belly on David Krejci with Nash and Travis Dermott battling in the blue paint. The Maple Leafs went back ahead 43 seconds later when Marner controlled a pass off the boards from Rielly before feeding Marleau in front. But the Bruins again responded when Chara ripped a shot off Andersen’s mask and in from an impossible angle at 6:19. Toronto’s Kasperi Kapanen, who hit the post early his team’s ugly 7-3 loss in Game 2, found iron again later in the period on a shot that beat Rask clean, but Matthews would make no mistake later in the period. The Maple Leafs had a number of chances early as they returned to a boisterous Air Canada Centre before a controversial sequence led to the opening goal. Boston was left fuming after center Riley Nash, who returned to the lineup after suffering an ear laceration on March 31, was ruled to have put the puck directly over the glass for a delay of game penalty with just over three minutes left in the first, even though replays suggested otherwise. Toronto, which was 1 for 7 with the man advantage through the first two games, made the Bruins pay just 7 seconds later when van Riemsdyk scored his second goal of the series, slipping the rebound of Tyler Bozak’s initial shot through Rask at 17:05 to give the Leafs their first lead of the series. The Maple Leafs had a couple of other opportunities earlier in the period, but Rask stretched to rob Andreas Johnsson with a great save before Kapanen didn’t get all of his backhand attempt on a breakaway. But apart from van Riemsdyk’s goal, the biggest cheer came when Zach Hyman leveled Marchand with a solid hit that sent the Bruins winger flying. NOTES: Marleau’s first goal moved him past Gordie Howe into 17th place on the NHL’s all-time playoffs list. … Johnsson left the game in the third period favoring his left leg after he collided with Marchand, and did not return. … Toronto was again missing C Nazem Kadri for the second game of a three-game suspension for his hit on Tommy Wingels in Game 1, Tomas Plekanec was moved up from the fourth line to play between Marleau and Marner on the No. 2 unit. … Maple Leafs forward Leo Komarov sat out with a lower-body injury suffered Saturday, allowing veteran Dominic Moore to move into Plekanec’s old spot on the fourth line between Johnsson and Kapanen. … Hyman returned to the top line with Matthews and Nylander.